Inder Loves Folk Art: A boy and his pit bull. 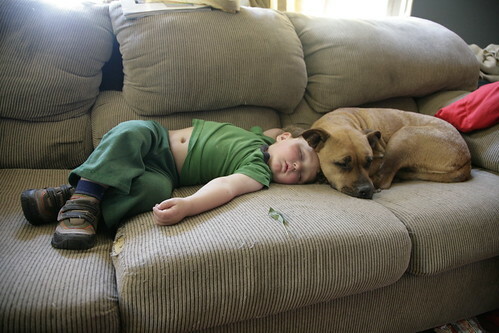 Napping on our (raggedy) couch. Joe is learning what we already know well. Direct contact with a snuggly pit bull makes a person sleep more deeply. To the point of sleeping in and missing an appointment. We call this "dog sleep poison." As in, "I'm sorry I'm late. 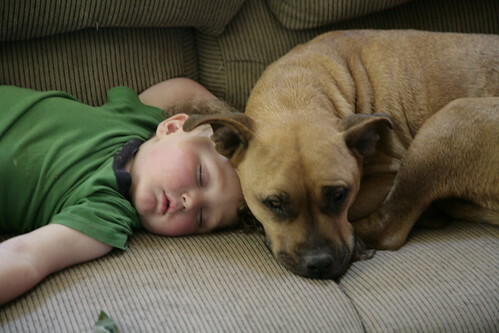 My pit bull Omie poisoned me and I just could not get up." Cuteness alert! See above, your blog description. Oh god. This is outstanding. Our dachshund has this very same effect! We call it his sleepy dog magic. If he snuggles into your belly in the morning, there is no escape!